After a sold-out staging of "Reeewind....Past Meets the Present" in October 2009, Dancehall tastemakers Irish and Chin are back with "Reewind & Come Again" on Saturday, March 27 at Club Amazura in Queens, New York. This time around -- the grassroots foundation series, which features the legendary King Stur Gav sound, will be headlined by "The Grammy Kid" Shabba Ranks, one of Reggae Dancehall's most accomplished artists. Shabba's performance at "Reeewind" will be extra special for more reasons than one. Not only does this rare "rub-a-dub" appearance mark the first time that Shabba has performed on a live sound in more than a decade, it also bills him alongside his icon and Dancehall forefather, Brigadier Jerry. Notably, "Reeewind & Come Again" will be Dancehall legend Tiger's long awaited return to the U.S. after being away for more than ten years. In the late 80's and early 90's, Tiger dominated the Dancehall industry with his bold fashion and string of hits. Tiger's energy has certified him as one of dancehall's greatest performers. "The Mellow Canary" Barrington Levy, who boasts more than three decades of timeless hits, will also headline "Reeewind & Come Again." 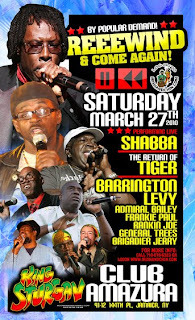 Although Barrington Levy hails from the sound system culture, this will be the first time that fans will get to experience him performing in a "rub-a-dub" style. Other top acts confirmed on the fiery line-up include "Jamaica's Stevie Wonder" Frankie Paul, "Hitmaker" and Dancehall legend Admiral Bailey, veteran artist General Trees and Rankin Joe. "Reeewind & Come Again" will be a night of historic magnitude.If you missed the sold-out first staging of "Reeewind" -- imagine thousands of people vibing to their favorite artists toasting over foundation riddims at a hot and heavy session that's incident free and chock full of good music and vibes. "One of my reasons for developing the 'Reeewind' brand was to reinvent modern day dancehall by offering patrons a positive environment and more entertainment for their money," says Garfield "Chin" Bourne of Irish and Chin. "Reeewind is the only event that offers artist entertainment from start to finish." The audience will get a taste of deejays and singers in rare form. While "Reeewind & Come Again" will be nostalgic for the mature patrons, it will be a straight Reggae 101 experience for the younger crowd. Also built on the premise of re-connecting Reggae artists with sound systems, "Reewind & Come Again" will surely exceed expectations. Stay logged on to http://www.irishandchin.com for event updates, advance tickets and more. Additionally, stay tuned to New York's IrieJam radio ( 93.5FM WVIP) for contests and ticket giveaways. Be a part of history on March 27, 2010!